The overall population of Alaska has remained steady over the past five years. But in certain areas of the state, it’s on the rise. Some of those areas are Alaska’s smallest communities. “It’s not the major population centers that are growing the most,” Hunsinger said. Many factors determine population. The basics are births, deaths, people moving in and people moving out. The Western and Northern Alaska population is young. That means fewer deaths and more babies being born. The Lower Kuskokwim School District is feeling the effects; many of its schools are overcrowded. Meanwhile, schools in other areas of the state are closing because there aren’t enough students. State estimates show that in 2017, 40 percent of the Yukon-Kuskokwim Delta’s population was under 20 years old. That same year shows 70 percent of the population under age 40. 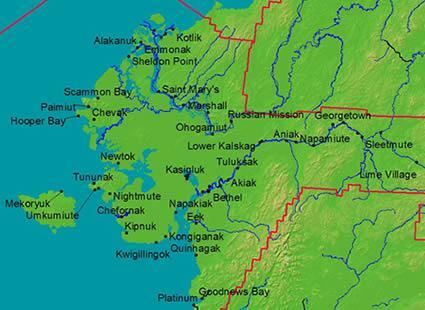 In 2010, state estimates show Bethel representing a quarter of the Yukon-Kuskokwim Delta’s overall population. By 2017, that number had dropped by two percentage points as village populations rose. This trend contrasts with other areas of the state that have much older populations like Southeast Alaska, the Southern Kenai Peninsula and the Haines Borough. Hunsinger cautions that collecting village population data has some limitations. “Household living arrangements are a bit different than in the rest of the state and other parts of the country,” he said. Multiple families often live in one house, and people may claim multiple places as residence. Nevertheless, the upward population trend of the villages appears undeniable, but it has yet to eclipse the fastest growing area of the state. That distinction belongs to the Matanuska-Susitna Borough.